Rosemarkie lies just to the north-east of Fortrose. It nestles in a hollow in the hills, with a beautiful sandy beach in front, and is backed by red sand cliffs which loom over it. The village is well-known for the Pictish stones that have been found there, some fragmentary but some complete. These stones are housed in Groam House Museum, on the High Street. Also, before the building of the Cathedral in Fortrose, it was the local centre of religion, and pilgrims came from all over the country to visit St. Boniface's shrine. The sand cliffs behind Rosemarkie are the favourite nesting sites of fulmars and jackdaws, and their cries form a muted background to visits there in spring. In places the cliff is festooned with creepers, and occasional overhanging trees. Just beyond these cliffs, on the main road, lies The Fairy Glen. This beautiful glen is deeply incised with the Markie Burn running through it. 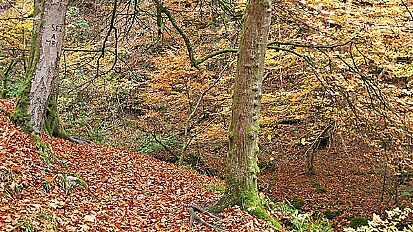 It is heavily wooded with largely deciduous trees, especially geans, birches and rowans, which render it spectacularly colourful in autumn. The burn itself has deep pools, waterfalls and rapids, with a path running beside it along the valley bottom. Fairy Glen is also an RSPB reserve, best known for buzzards, dippers, grey heron, grey wagtail and song thrushes. The glen is a haven for wildlife of all types, including the fairies, who, according to superstition, you must greet when you visit the area. Of great geographical interest are the sand pillars which can be found there. These are formed by the erosion of the soft sandy rock all round an area of hard rock. The hard rock protects the sandy rock beneath it from water erosion, and so the pillar gradually develops. Although such pillars can be seen in the rest of Europe, they are extremely rare in Britain. 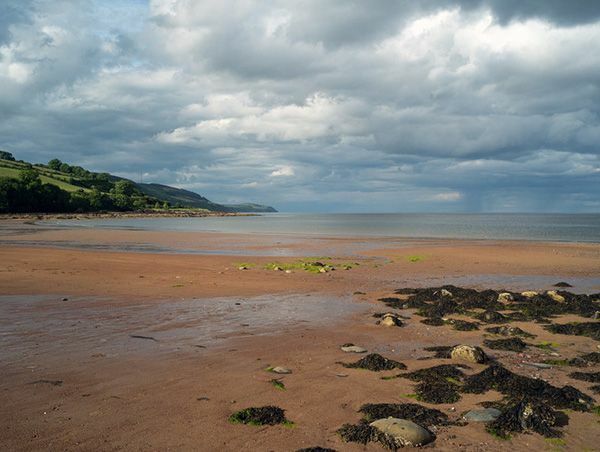 Rosemarkie beach is also of great interest, as fossils can be found a few miles along the beach to the north. For those not inclined to fossil hunt, however, the beach still has plenty to offer. It is pretty and secluded, and has outcroppings of rock from time to time where one can sunbathe or picnic and feel one is alone on the beach. Overhanging trees and creepers add to its character. 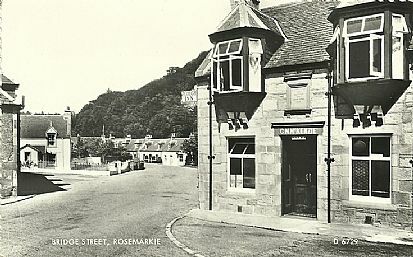 Rosemarkie is of great historical and geological interest but it is also a picturesque and peaceful little village and would be enjoyable for anyone to visit.